This is one of the more fun and interesting vintage finds we have seen recently: a set of four New York City subway ads printed in 1951. 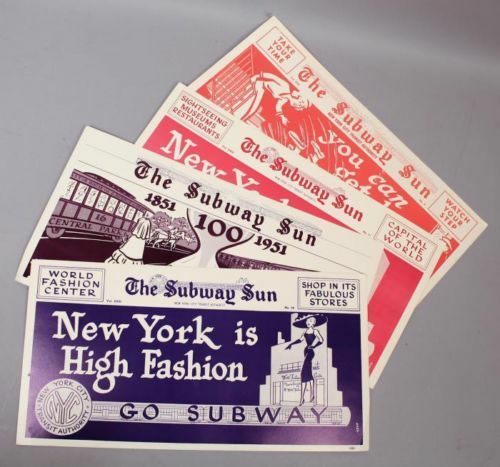 The set of 21" x 11" posters take the form of a newspaper header titled "The Subway Sun." Cartoonist Amelia Opdyke Jones (who always signed her work "Oppy") created these types of ads for the New York City Transit Authority in the 1940s and 1950s to promote good behavior and etiquette among subway users. 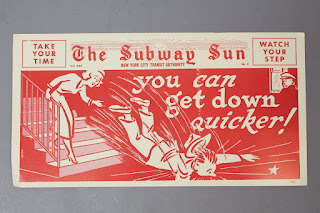 The New York Transit Authority originally hired Oppy to create cartoons to warm subway riders to the fare increase in the 1940s, however she Subway Sun ads were also eventually used to advertise technological improvements on the subway ("100 Years of Transit Progress"), as well as to encourage citizens to utilize the subway's services ("New York is Greatest - Go Subway"). 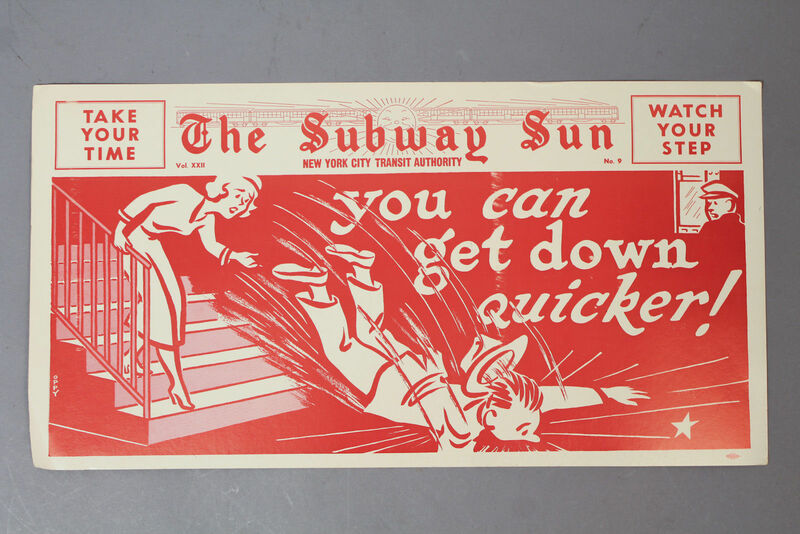 Perhaps most famously in her Subway Sun ads, Oppy called out some of the more crass behaviors some NYC subway riders were becoming more infamous for in a funny-but-too-true style. In our set particularly, there is a poster with an illustration of a man falling down the stairs to the subway interest with the caption "You can get down quicker!" while a concerned woman descending the stairs in a less deranged manner looks on. To prevent confusion, warnings to "watch your step" and "take your time" decorate the poster's top corners. Oppy also illustrated ads addressing other undesirable subway behavior, such as riders putting their feet on seats, littering, and smoking. The Monopoly-esque characters in the ads are largely recognizable as Oppy's work, and some have speculated that the women in the ads are often modeled after the artist herself. Many of the original Subway Sun ads are on display in the New York Transit Museum, but our small inventory is available for collectors or just lovers of vintage signage. Each individual poster is signed "Oppy" and marked for the New York Transit Authority.